On sale! 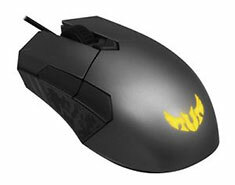 (normally $65) The TUF Gaming M5 is a compact ambidextrous gaming mouse that delivers the comfort, performance, and reliability that gamers demand. It's ergonomic and lightweight for prolonged campaigns, with a high-precision optical sensor that gives you an edge in battle. Backed by 50-million-click Omron switches and a specialised coating for exceptional durability, the M5 is validated for tough duty. It also features customisable ASUS Aura Sync RGB lighting so you can dominate in personalised style.